Location: Main Index » Forum Index » ChevyII-Nova-Acadian » 1962-1967 Chevy II-Nova-Acadian » Whats the proper igintion timing for a 283 V8? I just got my 62 running with a 283 V8, HEI 50K billet distributor and Edelbrock 600CFM 4 barrel. Anyone know the proper stock 283 setting for the ignition timing? Do you set it with or without the vacuum line plugged? Re: Whats the proper igintion timing for a 283 V8? Stock is 4* BTDC with the vac line plugged. If it has an automatic it is in gear with the wheels block, otherwise it is in neutral. Many people run with more advance than that, like in the 8*-12* range. Thanks for the assist sgian. Any idea what RPM the car should run in neutral? verses in gear? I'm trying to determine if the carb metering & springs are to rich or my idle settings & timing are off. My Chilton manual doesn't have the rpm listed before 71 for novas. My truck manual lists 500 rpm for non-emissions controlled 283's in 1967 (680 rpm for manual transmission emissions in neutral, around 550 or 600 rpm for emissions engines with automatics in gear). It is normal for there to be a difference in rpm for automatics between neutral and in gear. 62 Novas came only with a four or six cylinder engine. Your engine is from a different vehicle, and if it has been modified then it may need a different idle rpm and timing curve (especially if it has a big cam). a 600 is a little big for an otherwise stock 283. Hell, I have a pretty warmed over 283 and the 600 is a bit big! Anyway, set your timing at 8 degrees advanced and go from there. At idle, the only thing you should be touching on that edelbrock is the idle mixture screws on the front of the carb. The metering rods and springs play no part in the idle. They are part of the transition circuit. I would only worry about the metering rods and springs if you have a bog off idle, and then I would try a stiffer spring. 63 Chevy II SS, 283 .040 over w/vortec heads, edelbrock vortec rpm intake, comp cams XE256, and nothing else worth talking about! Thanks guys. I'm learning as I go, so bare with me. I too had the same concern that 600CFM was to large(it came with the car). I've changed the metering rods and springs to lean it out (fixed souty exhaust)but I'm concerned its still to rich. The Edelbrock chart shows one jet/rod set lower and thats it. So using the two front screws I should be able to throttle down the idle? What position do you set the manual choke and auto trans when setting the screws? The car is outfitted with a beefed-up aluminum auto powerglide, new edelbrock performer series cam, lifters, timing chain and manifold. Also the manifold vacuum pressure (measured at the carb) is a steady 12Hg. That seems high, but then again I have nothing to compare it against. Yes, you should be able to affect the idle speed a little with the mixture screws. If the screws are all the way in, it should run rough and/or stall. The choke should be off, and the transmission should be in gear with the wheels blocked so it won't move. Make sure both mixture screws are the same number of turns out. Otherwise half the cylinders will be rich and the other half lean. I use a vacuum gauge, lean out the screws (turn in until vacuum drops), then back out until it reaches the highest stable vacuum. Factory method is the lean drop, in which you adjust the screws for the highest rpm, adjust the idle speed for the specified "before" rpm (often between 580-700 rpm), then turn the mixture screws in until it reaches the specified "after" rpm (usually 20-50 rpm lower). 12 is actually low for vacuum pressure at sea level. At high altitude, add 1" Hg for every 1000' elevation. Vacuum should be stable between about 15 and 22, the closer to 22 the better. Now if someone put in too much cam for the compression ratio, then 12 is to be expected. I would say that Sgian hit the nail on the head! Best way to set the idle in my experience is by the vacuum guage as suggested. I am curious as to what cam you have in it, as mine is not wild, but a tad large, and I pull 12 HG at idle. I think you will find that the 600 will be hard to get "perfect" throughout the rpm range. You will either be rich at idle to keep it running with a large cam, or you will lean out at cruise. It will take some work to get it close to being stoich throughout the rpm band. Update: Turns out I was overlooking a simple, but critical adjustment. The hot idle screw adjustment on the throttle side of the Edelbrock carb. What a HUGE difference. I warmed up the engine and placed the manual choke wide open. Turning down the hot idle screw brought the engine right down to 700rpm. Next I disconnected and plugged the vacuum line leading to the advance, Connected the vacuum gauge to the left front port. No vacuum measured, unless the engine was throttled up. Plugged the vac gauge to the right side and BINGO its reading 18Hg. I turned the front mixture screws down till the engine nearly stalled. Then backed them out 1 1/2 turns. The car now idles up to 1K when the choke is pulled open and down to 700 rpm with it closed. The exhaust still smells a tad rich, so I'll purchase a set of leaner metering rods and jets. BTW: Rear in my '67 orig. 283 PG car is 3.08, not 3.36! I got 3.36 stuck in my head for some reason and have to go correct another entry too! Welcome to CT. Assuming you are using at least mid grade fuel and the vacuum advance works, I would say 8 degrees initial is a good starting point, drive it and see if you get any detonation on loaded acceleration. Btw, in the future, start a new thread, this one was really old. Edited by Shepherd on 11-02-18 06:26 AM. Reason for edit: No reason given. Lets say you are in high gear at a relatively low speed, engine at operating temperature, accelerating from there without a downshift, if the fuel was low octane and/or the timing was too far advanced, it would audibly ping or knock. And to add to that, a hesitation or backfire would indicate not enough timing. that and possibly a weak pump shot. all this speculated tuning adjustments are just that. the engine is modified and the tuning parameters can only be dialed in by driving style. 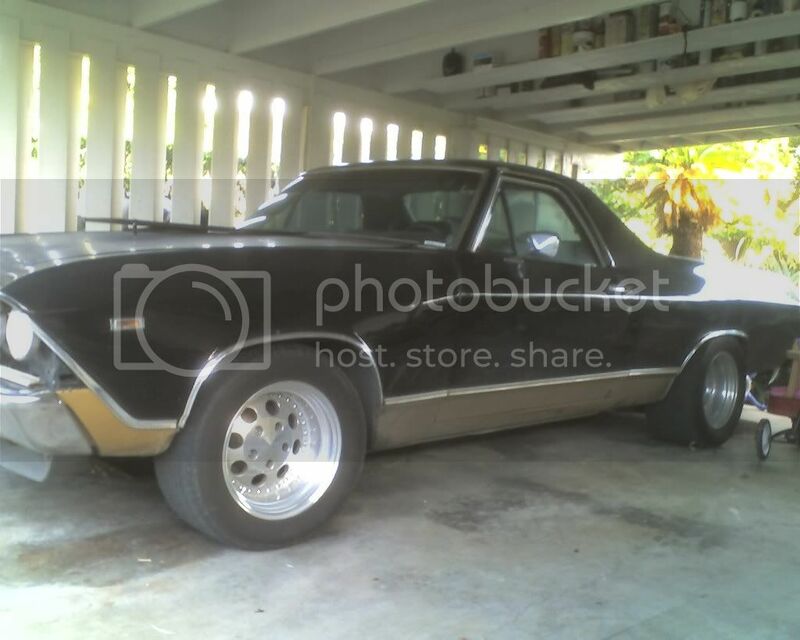 70 L camino, grampa engine, g-force 5 spd, road rage suspension. Pray first before all else fails. Execution time: 0.089 seconds. Total Queries: 17 Zlib Compression is on.